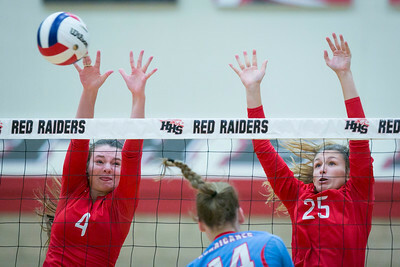 Daryl Quitalig - For Shaw Media Huntley middle blocker Marissa Deem (4) and outside hitter Julia Johnson (25) jump for a block during the championship match of the Huntley Invite at Huntley High School on Saturday, Oct. 8, 2016. 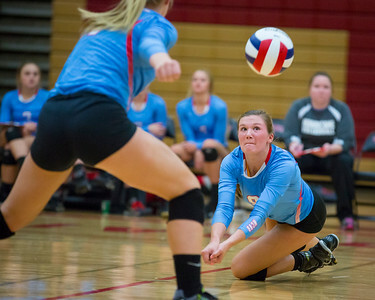 Marian Central defeated Huntley, 25-22, 28-26. Daryl Quitalig - For Shaw Media Huntley outside hitter Alyson Dion (6) spikes the ball during the championship match of the Huntley Invite at Huntley High School on Saturday, Oct. 8, 2016. 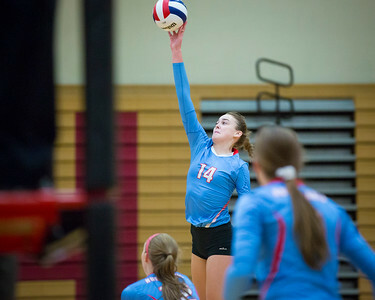 Marian Central defeated Huntley, 25-22, 28-26. 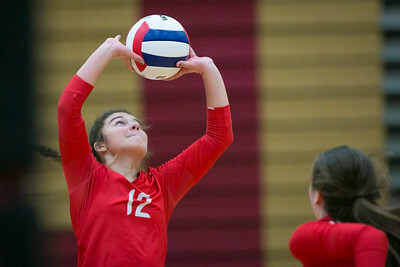 Daryl Quitalig - For Shaw Media Marian Central right side hitter Lauren Hanlon (14) tips the ball over the net during the championship match of the Huntley Invite at Huntley High School on Saturday, Oct. 8, 2016. Marian Central defeated Huntley, 25-22, 28-26. 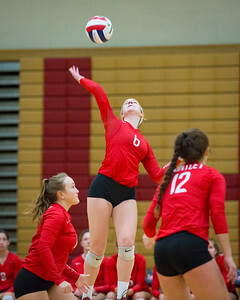 Daryl Quitalig - For Shaw Media Huntley setter Taylor Jakubowski (12) sets the ball during the championship match of the Huntley Invite at Huntley High School on Saturday, Oct. 8, 2016. Marian Central defeated Huntley, 25-22, 28-26. Daryl Quitalig - For Shaw Media Huntley outside hitter Julia Johnson (25) spikes the ball during the championship match of the Huntley Invite at Huntley High School on Saturday, Oct. 8, 2016. Marian Central defeated Huntley, 25-22, 28-26. 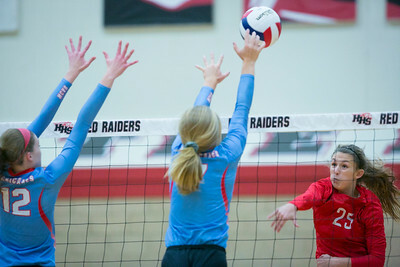 Daryl Quitalig - For Shaw Media Marian Central outside hitter Brenna Koch (9) bumps the ball during the championship match of the Huntley Invite at Huntley High School on Saturday, Oct. 8, 2016. Marian Central defeated Huntley, 25-22, 28-26. 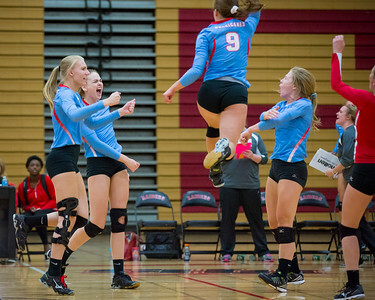 Daryl Quitalig - For Shaw Media Marian Central's Emily Radecki (13) and Lauren Hanlon (14) celebrate with teammates after winning the championship match of the Huntley Invite at Huntley High School on Saturday, Oct. 8, 2016. Marian Central defeated Huntley, 25-22, 28-26. 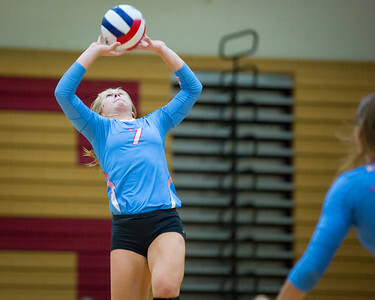 Daryl Quitalig - For Shaw Media Marian Central setter McKayla Wuensch (7) sets the ball during the championship match of the Huntley Invite at Huntley High School on Saturday, Oct. 8, 2016. Marian Central defeated Huntley, 25-22, 28-26. Daryl Quitalig - For Shaw Media Huntley defensive specialist Sarah Zayas (5) sits dejected after giving up the first set of the championship match of the Huntley Invite at Huntley High School on Saturday, Oct. 8, 2016. Marian Central defeated Huntley, 25-22, 28-26. Marian Central's Emily Radecki (13) and Lauren Hanlon (14) celebrate with teammates after winning the championship match of the Huntley Invite at Huntley High School on Saturday, Oct. 8, 2016. Marian Central defeated Huntley, 25-22, 28-26.